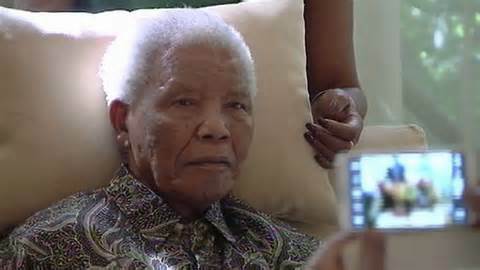 “We really need to feel comforted that we still have him with us now and will have him with us in future,” Mbeki said. Nelson Mandela’s health is improving after a two-week stay in a South African hospital where he is receiving treatment for a recurring lung infection. Mandela may be discharged from the hospital soon, the Johannesburg-based Star newspaper reported today, citing his grandson, Ndaba Mandela. The family will continue to celebrate him “as long as he can still hear and understand what is said to him, and talk to us,” the newspaper quoted Ndaba as saying. Mbeki, who became South Africa’s second black president when he succeeded Mandela in 1999, stepped down nine years later after the youth league of the ruling African National Congress helped Zuma oust him as party leader in 2007. Mandela, who was imprisoned for 27 years for opposing white minority rule under apartheid, took office in 1994 after the ANC won the first all-race elections. Known by his clan name Madiba, Mandela won the Nobel Peace Prize in 1993 together with former President F.W. de Klerk.